Complement : Officers 29. Enlisted 272. Largest boom capacity 40 t.
Cargo Capacity: Navy Standard Fuel Oil 62,300 bbls. Armament: Two single 5"/38 dual purpose gun mounts, four twin 40mm AA gun mounts, four twin 20mm AA gun mounts. Fuel oil capacity 4,780 bbls. Ship's service generator. Four turbo-drive, 3 60kW 120V D.C., 1 75kW 120V D.C., two diesel-drive, 100kW 450V D.C. Propulsion: One Newport News vertical quadruple expansion engine, two Yarrow boilers, 265 psi saturated steam single screw, 2,800 shp. 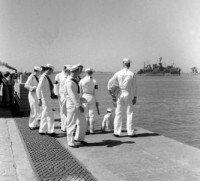 From March 1941 to September Patoka delivered fuel oil and general cargo to various units of the Fleet in the Atlantic Gulf, and Caribbean areas. On 28 September she departed Norfolk and proceeded, via Aruba, to Recife Brazil. Patoka made one more round trip to Recife before the United States entered World War II. 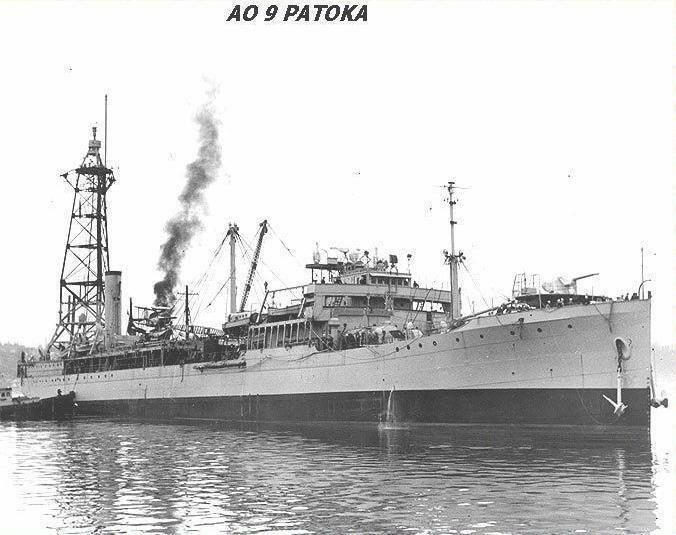 On 7 December 1941, Patoka was moored at Recife, acting as tanker, cargo, store ship, and repair ship. Here she supplied the units of Task Force 3 (later 23) with fuel, diesel, lubricating oil; gasoline, stores, provisions; and repairs. Shortly after the turn of the new year 1942, she got underway for Bahia, Brazil, anchoring there 8 January. There, she received word that ships bearing rubber and other vital war goods had left French Indo-China bound for the Axis controlled ports in Europe. 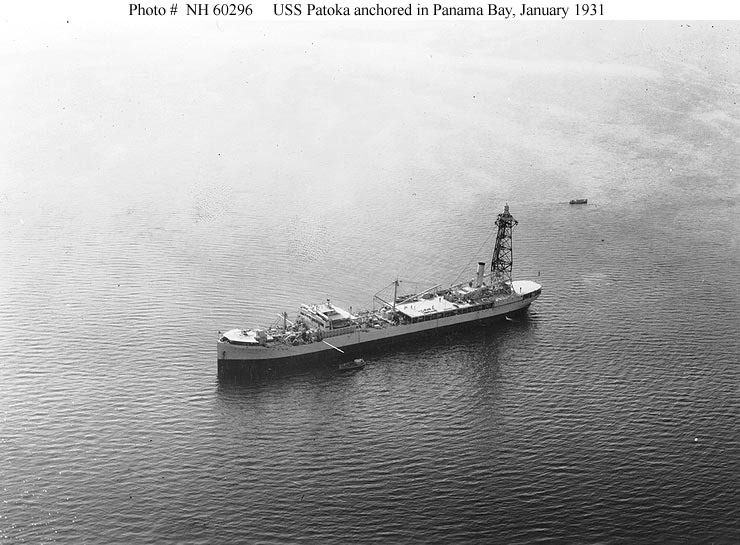 Patoka requested and received permission to patrol the shipping lanes off Bahia. When she had completed her patrol duties she put into port and returned to Recife 22 January. Six days later she was bound for San Juan, Puerto Rico, but en route she was diverted to Trinidad, B.W.I. Taking on fuel and stores she returned to Recife.Standing out of the harbor 21 February, she again set course, changed several times to avoid reported submarines and reached San Juan, Puerto Rico 4 March. Her return trip to Recife was made without incident. On 25 May 1942, while again returning to Recife from Trinidad escorted by Jouett, Patoka sighted an enemy submarine on the surface. Jouett attacked, forcing the U-boat to dive and continued the attack until Patoka had escaped. 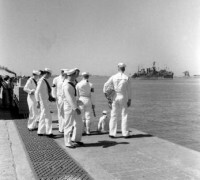 Patoka remained at Recife, continuing to supply the ships of Task Force 23 with provisions, supplies and tender services until April 1943, with occasional trips to Puerto Rico and Trinidad for replenishment. Patoka then got underway for home, reaching Norfolk 22 May for overhaul. She sailed for New York 6 August to join a convoy bound for Aruba, N.W.I. and resumed operations along the coast of South America. In April 1944, she carried 62 prisoners of war (German naval and merchant marine personnel) from Rio de Janeiroto Recife where they were turned over to the U.S. Army.